Have you ever wished to have a flash drive so small that it could fit in your pocket without bothering you? 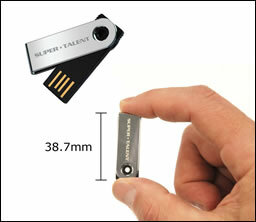 If your answer is yes, then the 8 GB SST Pico Drive from Super Talent might be the flash drive for you. Measuring a mere 38.7 mm, just about the size of an American quarter, this flash drive will fit quite nicely in any place that you might want to put it.